The Department of Education has focused mainly on delaying and gutting two regulations—borrower defense and gainful employment—that protect students from fraudulent and low-quality schools. In June 2017, the department delayed the borrower defense to repayment rule, prompting many consumer protection groups, including the National Consumer Law Center, the Harvard Legal Services Center Project on Predatory Student Lending, and state attorneys general from 18 states plus the District of Columbia to take legal action to prevent the department from undermining the rule. As mentioned above, the suit filed by the Harvard Legal Services Center Project on Predatory Student Lending gained substantial ground when a judge struck down the department’s delay in implementing the borrower defense regulation, ruling that the delay was illegal. Early last week, the judge ruled on next steps in the case, giving the department 30 days to fix the issues identified in the implementation of the original delay. While it is unclear how the department will respond, the ruling has given significant credence to the harm that borrowers have experienced as a result of this delay—a major victory for borrowers and consumer protection advocates. A separate lawsuit involving borrower defense, also filed by the Harvard Legal Services Center project, led to another victory when a judge ruled that the Department of Education’s actions in the case were arbitrary and illegal. At the beginning of 2018, the department announced that it would only grant partial relief, not full loan forgiveness, to borrowers who had been substantially misled by Corinthian Colleges, a for-profit college system that shut down in 2015 due to its fraudulent behavior. In June, the Harvard project sued the department, claiming that the department’s decision was arbitrary, capricious, and illegal. A federal judge found that the department had violated the law by unlawfully sharing borrowers’ personally identifiable information, such as Social Security numbers, with the Social Security Administration (SSA) in order to obtain earnings data from the SSA without borrowers’ permission. As a result of this ruling, the department postponed federal student loan payments and stopped debt collections for Corinthian students until it can establish an alternative process for processing debt-relief claims. Unfortunately, however, the department is still fighting this ruling in the courts, and many borrowers who have submitted claims are now in limbo, waiting on the relief they are due. As of June 2018, more than 165,000 borrowers have submitted claims for borrower defense, and less than 30 percent of these claims have been approved. In the absence of a process that grants students full debt relief, advocates will need to continue to push the department to ensure that borrowers who have been misled by for-profit institutions receive the relief to which they are entitled. Another front in the fight over consumer protection is the gainful employment rule, which is designed to prevent poorly performing for-profit colleges from receiving federal financial aid. Unsurprisingly, the Department of Education is trying to rewrite and eliminate the rule, but the department also appears to be undermining it while it remains on the books. Among gainful employment’s provisions is one that requires programs to maintain a certain debt-to-earnings ratio. This means that graduates from a program cannot have too much debt in comparison to their earnings. For-profit institutions that fail this measure are allowed to appeal and request that the department recalculate their ratio if they believe that alternate earnings data would change their results. Although the department has granted 66 appeals, it has marked the rest as “abandoned” or “pending”—giving the appearance that the department is not enforcing the rule properly. In May, the NSLDN filed a lawsuit to compel the department to release documents that would explain why it has failed to deny any appeals under the rule. Another recent lawsuit provided transparency into the department’s efforts to revive a troubled accreditor without compelling it to substantially reform its practices. Accreditors are gatekeepers tasked with ensuring that colleges are of sufficient quality to receive federal financial aid. The Accrediting Council for Independent Colleges and Schools (ACICS), has a long, documented history of neglecting its duties and applying insufficient standards, and in December 2016, the Obama administration put ACICS on notice that it could no longer continue in its capacity as an accreditor. However, after ACICS fought the decision in the courts, winning a new review, Secretary DeVos has at least temporarily revived it. The Century Foundation (TCF), a Washington, D.C, think tank, in partnership with the NSLDN, sought documents that would provide insight into this opaque decision. When the department failed to respond appropriately to requests under the Freedom of Information Act (FOIA), TCF sued. A U.S. district judge reviewed the case and ruled in favor of TCF, legally compelling the department to release documents that made clear the fact that ACICS had made no substantive effort to reform its practices or standards, even though ACICS continues to argue otherwise. So while it looks like the failing accreditor will be given a second chance, the release of these documents has allowed consumer, advocacy, and policy groups to expose some of ACICS’ bad practices and continue to keep a watchful eye on its future performance. In partnership with watchdog group American Oversight, the NSLDN has also filed two suits that shed light on recent department decisions regarding the student loan servicing industry. 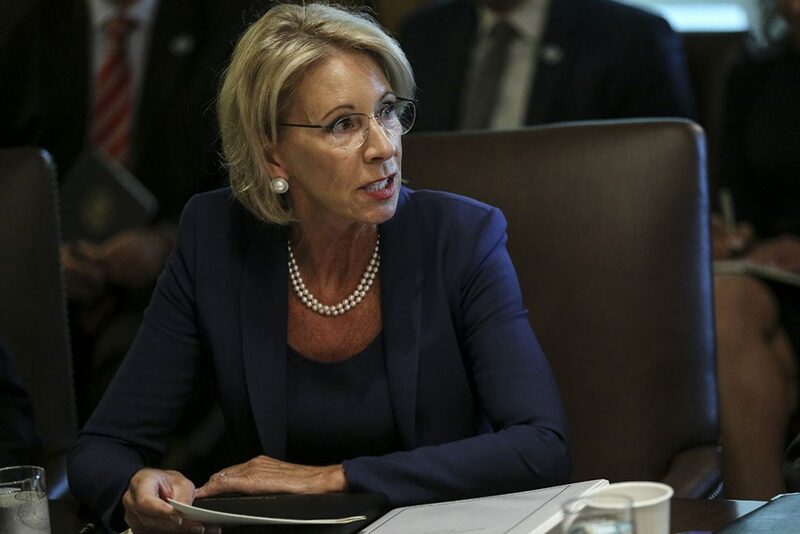 Among many recent changes to student loan servicing, the Department of Education has sought to curb states’ role in oversight of these companies. In March, the department released a notice that states do not have the legal authority to restrict abuses by student loan servicers or apply state-based consumer protection laws. This move ran so contrary to previous interpretations of states’ role in protecting borrowers that leaders at American Oversight and the NSLDN found it hard to believe the department reached those conclusions without significant influence from servicers. To uncover what led to these decisions, the NSLDN and American Oversight sought, under FOIA law, to obtain communications between the department and student loan servicers to see if servicers had any role in crafting the guidance, something that would present a serious conflict of interest. When the department failed to release the documents, the groups filed a lawsuit. These same watchdog groups also filed a separate FOIA lawsuit to see what role the department had in helping Navient, a major student loan servicer, fight enforcement action by the Consumer Financial Protection Bureau (CFPB). In January 2017, the CFPB announced that it was suing Navient for creating unnecessary obstacles to repayment for borrowers, including incorrectly processing payments and engaging in other bad practices. The case is ongoing, and the Department of Education provided Navient with documents pertinent to the case but refused to provide the CFPB with the documents it requested, even going so far as to refuse to authorize Navient to share the documents it received with the CFPB. So while a federal judge ordered Navient to turn over documents to the CFPB, the FOIA lawsuit seeks to uncover evidence about why the decision to withhold the documents was made and illuminate any conflicts of interest that may have influenced the department’s decision to refuse the CFPB’s request for documents. Many civil rights groups have also filed lawsuits challenging the department’s rollback of critical guidance on Title IX. Title IX provides students vital protections against discrimination, harassment, and assault. In 2017, the department decided to roll back previous guidance on how colleges and universities treat cases of sexual violence and assault on their campuses. The rollback meant that colleges and universities could begin to use a higher standard of evidence, making it more difficult for survivors of sexual assault and violence to bring forth their cases. In response, advocacy groups such as the National Women’s Law Center, the National Center for Youth Law, the Democracy Forward Foundation, and others rallied together to sue the department for weakening the ability of Title IX to protect those who have experienced harassment and discrimination. Under the leadership of Secretary DeVos, the Department of Education has pursued an agenda that is harmful to students—and it has done so with a variety of tactics of questionable legality. Throughout DeVos’ tenure as secretary of education, she has made clear that in the absence of strict oversight from Congress, her department will skirt transparency in order to execute policies that benefit bad actors at the expense of students and taxpayers. Legal groups and student advocates have steadily worked to hold the administration accountable, but it is important that they—and policymakers—remain vigilant and continue to challenge DeVos when her department engages in questionable and harmful actions.